Customer preferences and requirements are crucial for manufacturers, suppliers, and retailers, in order to predict the market trends accurately. Thus, suitable forecasting models have emerged as mainstream necessities for these industries. Despite the fact that no forecasting model fulfils all of the necessary prerequisites, businesses rely on analytics tools, systematic patterns and trends, forecasting and data mining techniques, which empower them to be better prepared to anticipate the customer demands. As a result, forecasting solution providers are devising analytics tools, techniques, neural networks, and data mining processes that are capable of converting raw data into valuable information. One of the most commonly used techniques in demand forecasting is the time series analysis methodology. Organizations are leveraging this practice to detect patterns in data sets and decode those patterns into predictions. To understand the time series data and extract useful statistics, autoregressive integrated moving average (ARIMA) model is widely being used among businesses. Additionally, technologies such as neural networks have remarkable ability to decipher complicated or imprecise data and are used to analyze patterns that are complex. Several neural networks procedures such as multilayer perceptrons, radial basis functions neural networks, multivariate adaptive regression splines, machine learning (ML), and tree algorithms are used to study the patterns and predict the outcomes of any unknown event. Owing to these myriad approaches, businesses will continue to look for specific patterns, in order to make accurate predictions, and CIOReview’s latest edition comes as an answer to their forage. 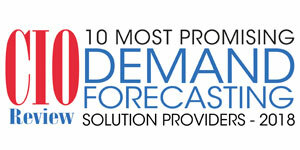 To help organizations achieve better accuracy in forecasting, we present CIOReview’s “10 Most Promising Demand Forecasting Solution Providers – 2018.” This edition will help businesses in choosing a solution provider that can assist them in improving the “forecast-ability” of consumer demands.